Whether you want a delightful way to start your brain kicking in the morning, a fun activity to do with friends over a cup of coffee, or a way to relax into sleep late in the evening, we made this game for you. 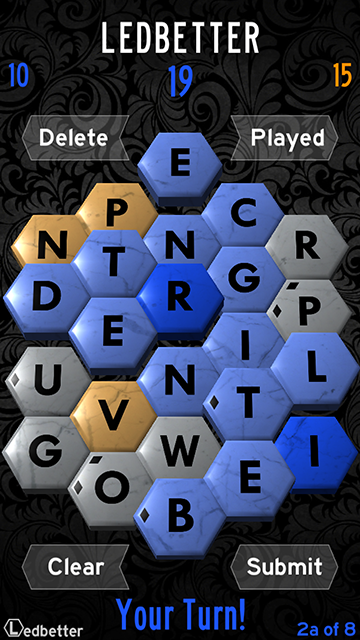 If you like word games, you'll love Ledbetter. Assemble your words from any tile on the board—whether connected or not—the only limits are your imagination, your creativity, and our 280,000-word dictionary. But beware: the longest word is not always the best play. Balance vocabulary with territorial strategy to get the most points each turn. Check out the gameplay video (coming soon) and sign up for our mailing list. We're currently seeking beta testers and would love to have your input to make this the best game it can possibly be. Won’t you join us?